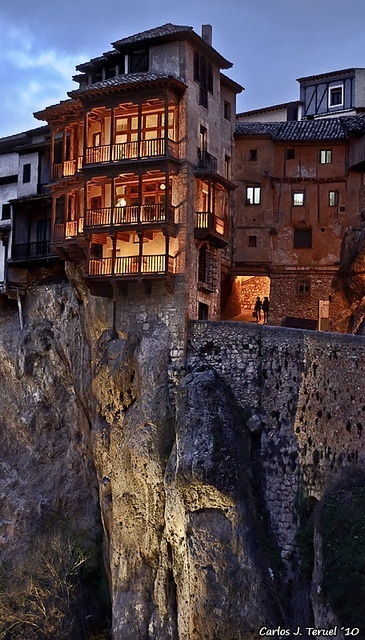 Cuenca is located across a steep spur, whose slopes descend into deep gorges of the Júcar and Huécar rivers. It is divided into two separate settlements: the "new" city is situated south-west to the old one, which is divided by the Huécar course. The climate of Cuenca is the typical continental Mediterranean of Spain's "Meseta" (inner plateau). Winters are relatively cold, but summers are quite hot. Spring and autumn seasons are short, with pleasant temperatures during the day but with rather cold nights due to its altitude from 956 m above sea level up to 1000 m in the old town.